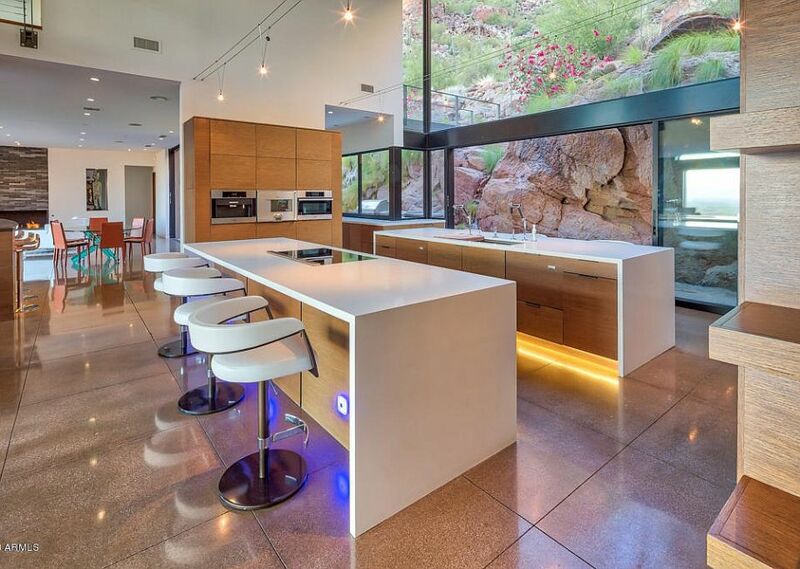 I don't think that modern kitchen design could get any better than this awesome espresso themed space. 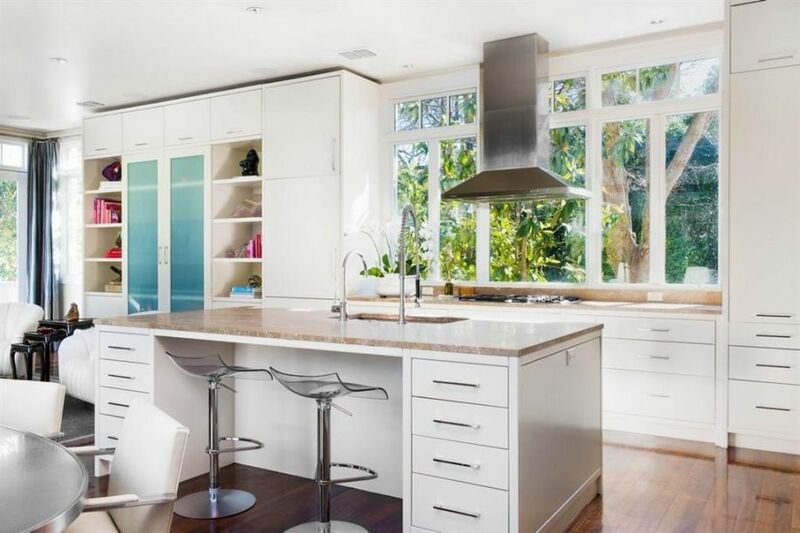 Most modern kitchen ideas that I have seen lately feature bright white cabinetry in a sleek and monochromatic room. This homeowner, on the other hand, allowed us to play around with finishes and color palettes in a different way than most, and really play off of the cool natural stone architectural elements that they have around the rest of their home. As you can see, the stone wall in the entry to the kitchen inspired our soft grey backsplash, contrasting dark brown cabinetry and simple kitchen island with seating. The kitchen pictures we posted here certainly do not do the space justice, I think it is actually much more beautiful in person. I was on the fence on how to incorporate modern kitchen design in my previously contemporary space without having to gut the entire area. I wanted to create a brand new design on a budget without necessarily having to invest in brand new modern kitchen cabinets for the whole room. What we did was pick and choose certain areas and specific elements to transform from traditional to contemporary in order to change the overall style of the space. One such area was the area on the back wall beside the window and range. We removed the wall cabinets and instead opted for cool floating shelves and an industrial style subway tile wall. If you love marrying traditional and modern kitchen design like I do then you will be over the moon about this cool marble, white and brass room. I wanted to create a fun twist on your typical white kitchen designs, so I started with a fairly traditional base of lightly paneled white units, but added some flare by installing double islands in contrasting finishes and styles. The first is a very traditional black island with marble countertop intended as a prep space, while the other is a sleek and modern unit that combines natural wood and marble in an awesome geometric shape. These dueling islands, so to speak, act as the foundation for the other modern kitchen design ideas that I incorporated just as the highly marbled backsplash, sleek brass hood, and unique square pendent lights. I think that it is a common misconception that modern kitchen design has to be cold and unfeeling -- you can still create a warm and inviting space without adding all of the trimmings of a traditional style space. 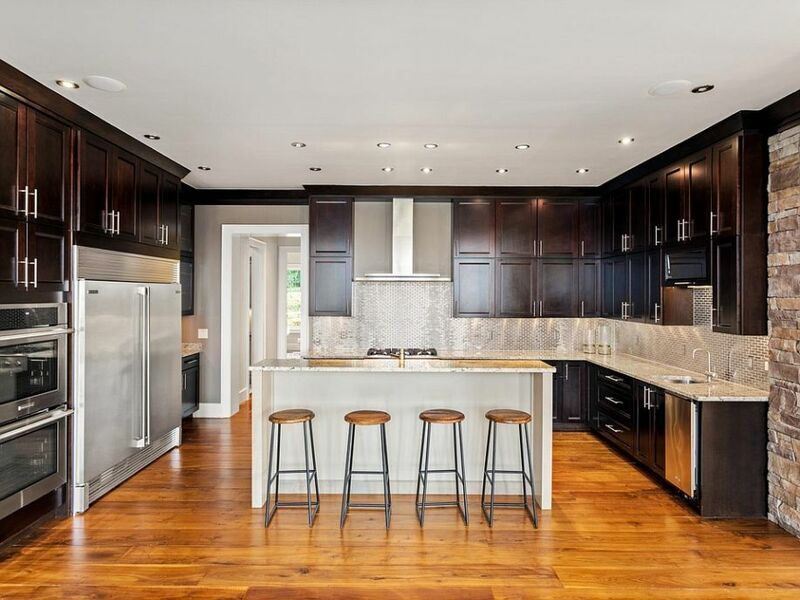 We accomplished this task in our new home by installing modern cabinets in a warm wood finish that added that classic touch but with a contemporary twist. The shade and texture of the wood brightens up the space and gives it a twist on your more traditional natural wood kitchens (that are usually in a country style). 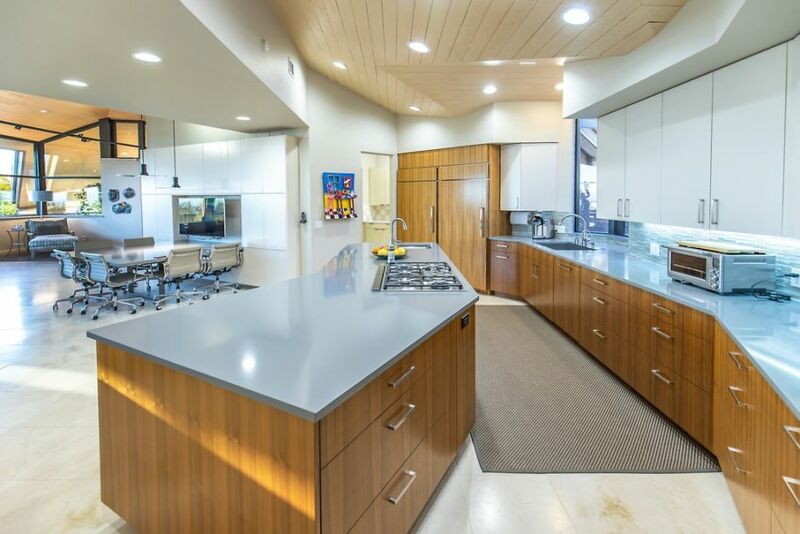 We then added a few more popular modern kitchen design 2019 touches like cement countertops, contrasting cabinet colors and a unique ceiling finish to amp up the overall style. I absolutely adore this modern kitchen design because it is so whimsical and unique -- it almost looks like you stepped onto the set of The Jetson's or into a cool futuristic Disney World ride. Most modern style kitchen designs that I have seen and/or developed have a similar base as this particular space. 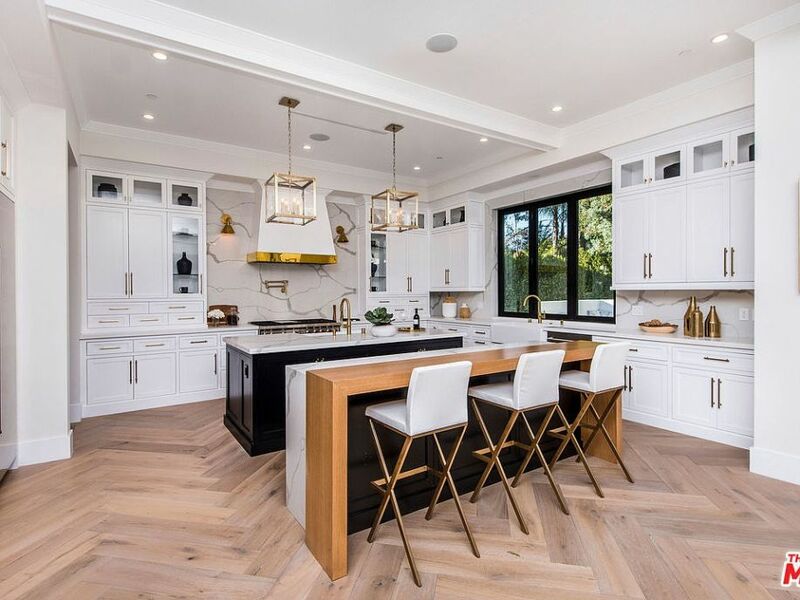 Simple white and natural wood cabinetry with little to no panelling or adornment, sleek countertops, and a lot of clean lines and open spaces. What they don't all have is awesome LED lighting features that bring color and pizazz to the space without being overwhelming. 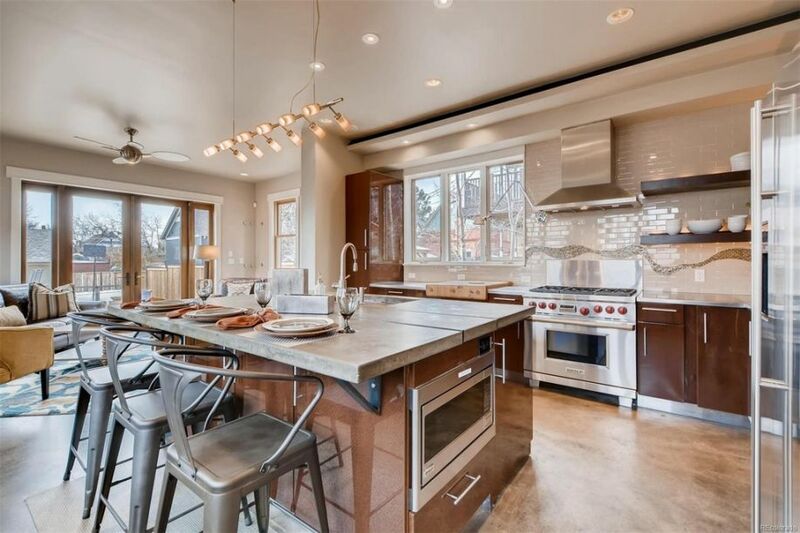 The under lighting on the island actually takes advantage of the larger kitchen layouts, and makes you feel like you are in different zones of the room. Modern kitchen design has always been my favorite for a home because it feels so clean, uncluttered and spacious (at least the particular looks I love do). As I began planning out my own small kitchen remodel ideas, I knew that I wanted to create a contemporary space that fit all of these adjectives. We kept everything simple and white but with much sleeker lines than your average traditional or country style kitchen. The geometric edges, bright chrome cabinet pulls and simple granite countertop embodied the modern feel I wanted to create. Then we added some funky touches to our modern kitchen cabinet design by swapping out the wood pantry doors with these awesome aqua blown glass units.